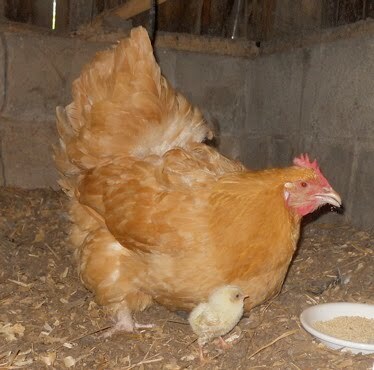 At breakfast today, Mama Hen said to her chickie "let's take a walk." At least I think that's what happened, because when I opened the door to refresh their water and food, out they strolled. Now I have to explain that I did not have the camera at hand when this occurred. 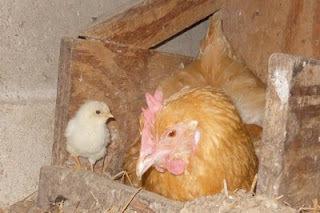 And I hung around just to make sure Mama Hen was confident enough to keep the other chickens away from baby. By the time I got back to the barn a couple of hours later, I discovered Mama Hen finding a place to rest with baby. And you can watch that part! It's so clear to me that the baby trusts Mama 100%. Wherever Mama goes, baby follows. If they get separated, baby just needs to peep louder and Mama clucks reassuringly and they return to each other. So once they settled in, they had a little conversation. And then baby decided she wanted to rest somewhere other than under Mama's warm breast. So she found just the right place. Oh, pleez! You're killing me with cuteness!!!! Baby chicks are the BEST entertainment! Mama's like a stately ocean liner and Baby's a little dinghy buzzing around her. Very charming! 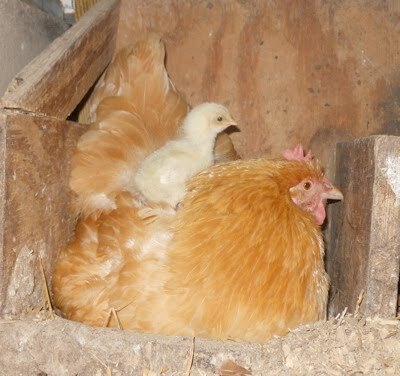 A mama with chicks is the absolute best and most peaceful scene.